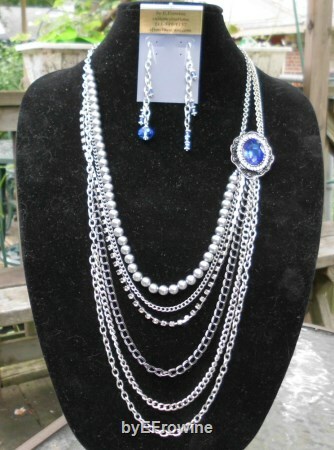 26-38 inches if silver and gunmetal chains suspend a Checkerboard cut Sapphire stone. Coordinated 3.25 inch earrings on french wires. Surround your self in chains cascading from a breath taking Sapphire colored stone worthy of protecting your heart. French wires capture the mismatched 3.25 inch earrings in stylish splendor.